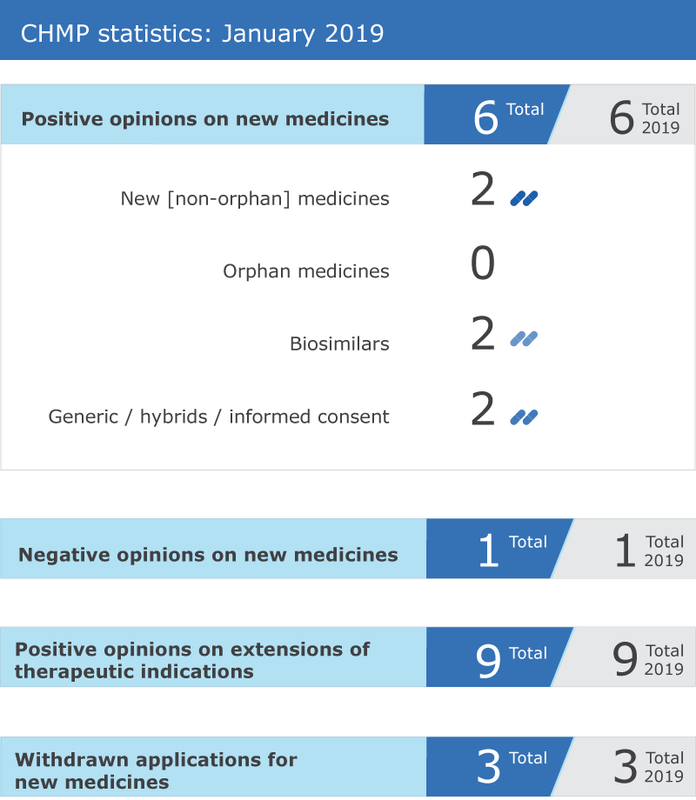 EMA’s human medicines committee (CHMP) recommended six medicines for approval at its January 2019 meeting. The CHMP adopted a positive opinion for Ajovy (fremanezumab), for the prophylaxis of migraine. Vizimpro (dacomitinib) received a positive opinion for the treatment of locally advanced or metastatic non-small cell lung cancer with epidermal growth factor receptor activating mutations. Two biosimilar medicines for the treatment of certain inflammatory and autoimmune disorders received a positive opinion from the Committee: Idacio (adalimumab) and Kromeya (adalimumab). The CHMP recommended granting marketing authorisations for two generic medicines: Atazanavir Krka (atazanavir), for the treatment of HIV-1 infection in adults and children 6 years of age and older, and Febuxostat Krka (febuxostat), for the prevention and treatment of hyperuricaemia. The CHMP adopted a negative opinion refusing a marketing authorisation for Doxolipad (doxorubicin). Developed as a hybrid medicine, Doxolipad was expected to be used to treat breast and ovarian cancer. Hybrid applications rely in part on the results of pre-clinical tests and clinical trials of a reference product and in part on new data. For more information please see the question-and-answer document in the grid below. The Committee recommended extensions of indication for Edistride, Forxiga, Hemlibra, Keytruda, Mabthera, Maviret, Orencia, Praluent and Tecentriq. The CHMP recommended an extension of indication of Forxiga and its duplicate Edistride to include for the first time adjunct treatment with insulin for certain patients with type 1 diabetes. For more information about these extensions, please see the press release in the grid below. Companies that make sartan blood pressure medicines (also known as angiotensin II receptor blockers) are being required to review their manufacturing processes so that they do not produce nitrosamine impurities. This recommendation follows the CHMP’s review of N-nitrosodimethylamine (NDMA) and N nitrosodiethylamine (NDEA), which are classified as probable human carcinogens (substances that could cause cancer) and have been detected in some sartan medicines. For more information, please see the public health recommendation in the grid below. The CHMP started a review of a study of the direct oral anticoagulants Eliquis (apixaban), Pradaxa (dabigatran etexilate) and Xarelto (rivaroxaban). This observational study assessed the risk of major bleedings with these medicines when used to prevent blood clotting in patients with non-valvular atrial fibrillation (irregular rapid contractions of the heart), in comparison with other oral anticoagulants. The review will assess whether the results of the study have implications on the use of the medicines. The Committee also started a review of the cancer medicine Lartruvo (olaratumab) after preliminary results from the ANNOUNCE study became available which showed that adding Lartruvo to doxorubicin does not prolong the lives of patients with soft tissue sarcoma more than doxorubicin alone. For more information, please see the start-of-referral documents in the grid below. Following the CHMP’s recommendation of 13 December 2018 on omega-3 fatty acid medicines, some of the marketing authorisation holders involved with this review have requested a re-examination. Upon receipt of the grounds for their requests, the CHMP will start a re-examination and issue its final recommendation. For more information on this review, please see the public health recommendation in the grid below. Applications for initial marketing authorisations for Cavoley (pegfilgrastim), Efgratin (pegfilgrastim) and Vynpenta (avacopan) have been withdrawn. Cavoley and Efgratin were intended to be used to reduce neutropenia. Vynpenta (previously known as AvacopanChemocentryx) was intended to be used to treat the blood vessel disorders granulomatosis with polyangiitis and microscopic polyangiitis. It was accepted in EMA’s PRIority Medicines (PRIME) scheme in May 2016. Question-and-answer documents on these withdrawals are available in the grid below. The agenda of the January 2019 meeting is published on EMA's website. Minutes of the December 2018 CHMP meeting will be published in the coming weeks. Key figures from the January 2019 CHMP meeting are represented in the graphic below. Treatment of patients with locally advanced or metastatic non-small cell lung cancer with epidermal growth factor receptor (EGFR) activating mutations. Treatment of HIV-1 infection in adults and children 6 years of age and older. Prevention and treatment of hyperuricaemia. Treatment of certain inflammatory and autoimmune disorders. Marketing-authorisation applicant TLC Biopharmaceuticals B.V. Treatment of breast and ovarian cancer.